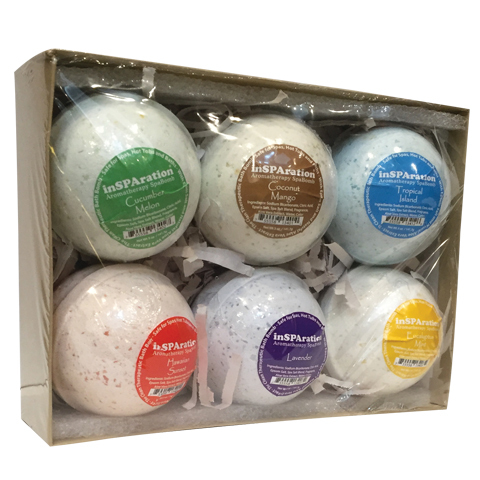 inSPAration's new SpaBomb Aromatherapy products are specially formulated for Spas, Hot Tubs, Baths and Jetted Tubs. SpaBombs are the clean, ultra therapeutic, fizzing Bath Bomb that will not cloud, foam, bubble, color the water or leave any unwanted oily residue. Made with Epsom Salt, Aloe Vera Extract and Vitamins making these the perfect Hot Water Spa & Bath Bomb. All the Fun without the Mess! Gift Box containes 6 assorted Spa Bomb fragrances.